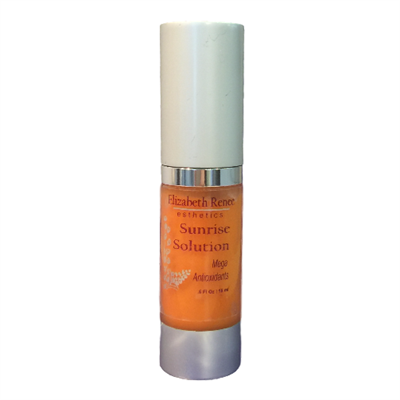 Those who are sensitive to traditional Vitamin C products, live an active lifestyle, excersize regularly or just have a desire for an ultra-effective dose of antioxidant protection will want to add Sunrise Solution to their morning regime. Damaging free radicals in the environment lead to premature aging. This formula combines today's top superfruits with state-of-the-art skin-protecting ingredients to fight these age aggressors. Mix one pump into your C & E serum or 2-3 pumps layered under sunscreen. Superfruits - We extract key components found in extracts of coffee berries, acai berries, gogi fruit, noni fruit, mangoes and pomegranates, which are among the most powerful sources of natural antioxidants available today. White and green teas - Powerful yet soothing for the skin, green and white tea neutralize free radicals from smog, secondhand smoke and other forms of pollution. Mushroom extracts - Brightens the skin as it helps interrupt the aging process that is aggravated by sugar and alcohol. Pear extracts - Helps protect DNA from sunlight-derived free radical damage.